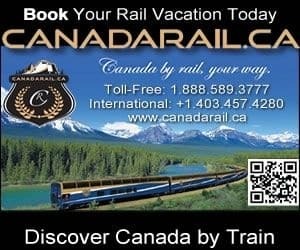 Detailed Description: Lost Lake Trail near Whistler, BC, Canada is a very popular adventure destination close to the village of Whistler, BC, Canada accessible by xc country skiers, mountain bikers, hikers, joggers, roller bladders and sun worshippers. The popularity of the trail is understandable since the trail system is so well maintained and is really easy to access. The 30 kilometre (18.4 mi.) Lost lake Loop Trail draws allot of attention in the winter seasons, mainly as a xc country skiing trail system created for all levels of ability. Some of the other xc country ski trails include Les' Leap, Vimy Ridge, Tin Pants, Hydro Hill and Poler's Road. 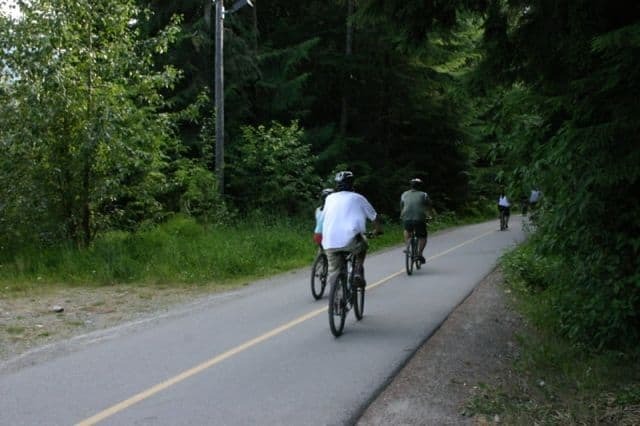 In the summer this Whistler, BC trail takes on a different personality and is better known for the large sandy beach, picnic areas, grass fields and the doggie beach. In the summer the paved and gravel trail in Lost Lake Park is heavily used by hikers, mountain bikers, joggers, roller bladders and dog walkers. 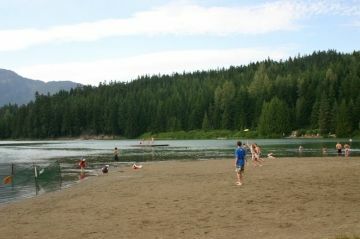 On the north side of the Lost Lake are the main swimming and picnicking areas with a beach and a doggie park. The sandy beach and grass fields are usually busy on a sunny day spotted with frisbees, sunbathers and umbrellas. The beachfront is sectioned off for swimming with a dock floating not far from off shore. The hiking and biking trails are highlighted with interpretive signs about the local flora and fauna. The trail system is often used as a transportation link for walkers, skiers and bikers because it connects to the Valley Trail . Which is the main trail in Whistler, BC, Canada connecting one end of the community to the other. Lost Lake Park has washrooms, picnic shelter, picnic tables and an automated concession stand. How to Get Here: The parking lot is small at the lake and is mostly for drop off only. The best way to access the park is to walk, bike or take a cab from village of Whistler, BC, Canada so parking will not be an issue. Some people park in the two large free parking lots in Whistler Village and from there roller blade, jog or bike to Lost Lake Park.